Sometimes I think God's timing is simply inspired. I had been feeling prompted for months to contact Katherine Nelson to write something for Emma Smith's Birthday celebration. When I finally got up the nerve to email her I was first, thrilled that she said she would, and second excited that her manager asked me if I'd like to review and help promote her new CD, Born Brave-- which just happens to be all about strengthening women and finding your inner power. 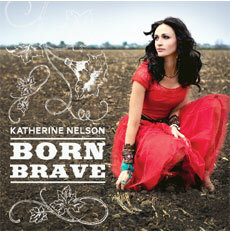 I have been listening to Born Brave for the last week or two as I've been driving my kids around in the car. I must have listened to it more than I thought because yesterday when I looked back at Rose she was singing her little heart out to "Born." She didn't really know any of the words but she would sing "Born" really loud, which made up for not knowing the rest. Women of the world... The odds are stacked against us. There is an adversary who knows all too well that the annihilation of the spirits of the Daughters of God will destroy families, communities, and even nations. Women have been born with the ability to reach inside for that instinct of survival, both physical and spiritual. Whether being passed down in our hearts by the countless women and mothers who came before us, or born out of our darkest hours of struggles. There is a deep well of strength that lies within us, that fuels our capacity to exercise courage, to face the unfaceable, and to rise above every circumstance. We carry the banner of faith, love, perseverance, and HOPE to all those within our circles of outreach in life. I truly believe that when we strengthen women, we strengthen the world. We are all born brave. "Truth is, I want so desperately to take a super-sized glittering spotlight and shower it over every woman in the world with this music until they feel they are valued. Loved. Needed. Admired. Followed. Looked up to by their daughters and other growing young women in their lives. I want it to get into their veins and bones and heart and soul so they know they matter. They offer a kind of love that is uniquely theirs to give. It must be that I’ve seen too many women not come home at the end of the day. And I get it. I’ve been there. I’ve wanted to pull out of the driveway and not come back when truth may be too hard to face and too uncomfortable to talk through, even live through. ... I’ve learned that personally it actually takes an ENORMOUS amount of guts to make it from day to day, year to year. 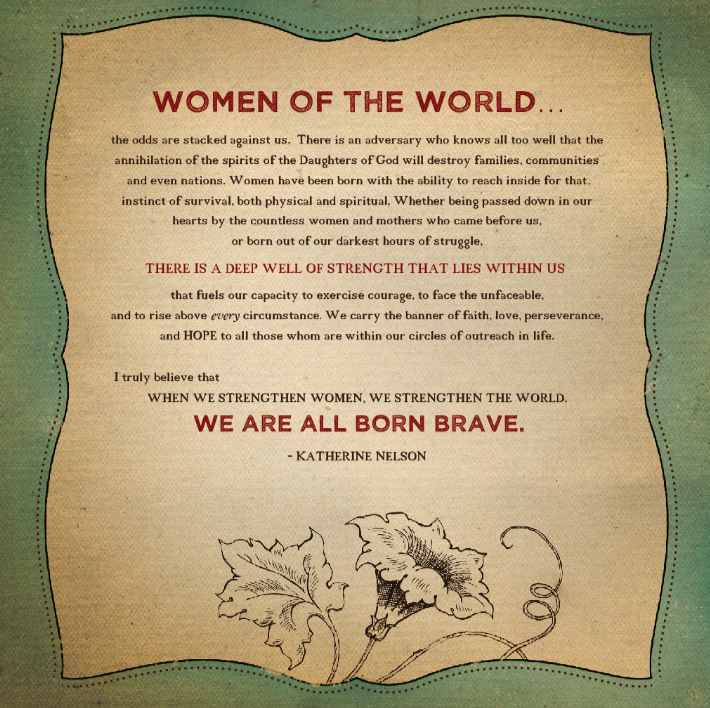 I think this is why I love the Born Brave woman. Looking back through my life and where I am now I have been blessed to know so many of them. You know them too. You probably are one if you think about it. Typically they are the women that will never make history, media or even a blog-post of any kind, although their effect on the world is immeasurable. Their names are often forgettable and accomplishments unrecognizable to the passerby. But they are strong. They are battling the toughest battles. They win, they lose, they keep going." I really love female vocalists but I am so often disappointed by the messages of their songs. Often they are either idealistic, angry, or advocate for the world's type of feminism-- which doesn't really jive well with my soul. 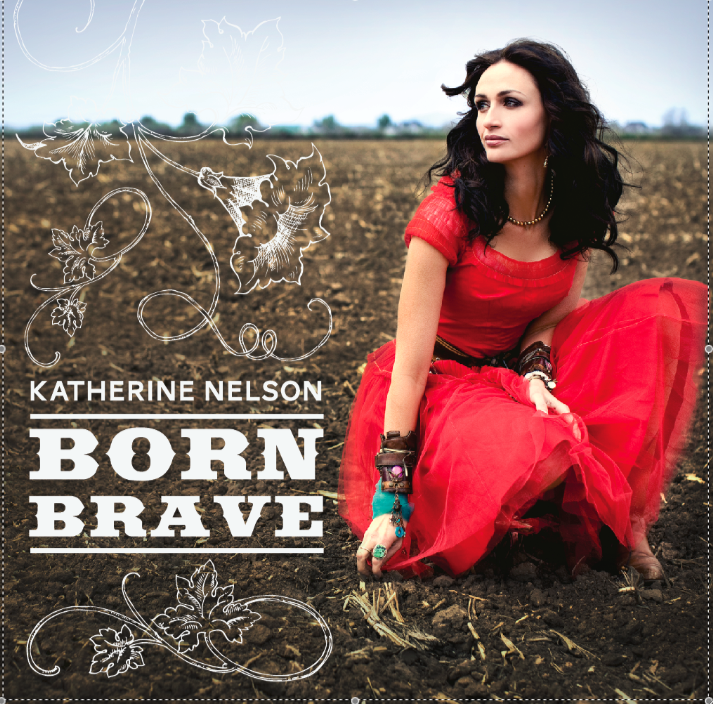 It was so refreshing to listen to Katherine's album and to hear her sing about strong and empowered women, who change the world through developing their talents, bearing children, loving men, creating a home, caring for those around them, and following the Lord-- even when it is really hard. After listening to her songs I felt a little bit more like there wasn't anything I couldn't do with the Lord's help. She reminded me that I have a legacy of strong women who came before me and that I am here to lead and teach the next generation of strong women. And that is really hard-- and really brave. In addition to having a great message I really love Katherine's voice. To me her style of singing is somewhere in between Alanis Morissette' s expression and the twang of Martina McBride. She has a wonderful blend of styles and I really like listening to her sing. She definitely has country to her (she did record in Nashville!) but I think that no matter what your music taste you will like her sound (unless of course you only like rap or polka, then you might be disappointed). I also thought it was really neat to hear her sing "Emma", especially after reading what she wrote about her experience portraying her. That was just icing on the top of the cake. Really, I loved so many of her songs. Though, I think that this is one CD that I will have to be in the right mood to listen to. There are certain songs that are really up beat and fun, but to listen to the whole thing all the way through makes me a bit emotional. This is one of those CDs that I will turn on those hard days, the days when I feel discourage and like nothing I do makes a bit difference. It is a good "pick me-up and remind me it is worth it" CD, which I really need some days. I just wanted to share with you a few of my favorite songs from the CD and my favorite lines, if you click on this link it will take you to a preview of the song on Katherine's website. I was born to fill the measure of my wings"
And I love my husband every night." They fell down as became you, you, you, you, and you, yes." I think I naturally liked the songs about motherhood the most, because that is the stage of life I am in, but there are songs here for all women. 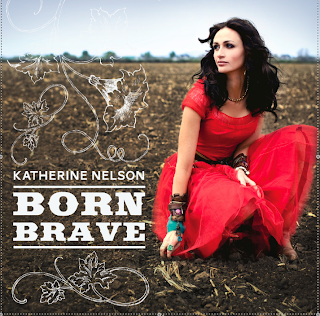 No matter what your situation I am pretty sure that there is a song on this CD that will speak to you and remind you that because you are a Daughter of God you were Born Brave. Thank you Katherine for making such a beautiful album! I wish I could go around with you and "take a super-sized glittering spotlight and shower it over every woman in the world with this music until they feel they are valued." I know it made me feel that way. Visit Katherine's website and preview her songs. Leave a comment telling me which on you liked the best. Share this post on Facebook, Twitter, or on your own blog. For each one you do you will get an entry to win, and just so you know if leave me two stories you will get two entries! The giveaway will end Monday August 6th! I just went through all of the songs and I would have to say that "Born" is definitely my favorite. I watched the little video on her homepage and I loved it. It is an inspiring song. Having just gone through a miscarriage, I think my favorite song is "What's mine is yours." I cried through reading the lyrics and then as I heard the melody and the music it brought peace to my soul. As the co-writer on "What's Mine Is Yours", and it being my personal story, I want to say how much your words mean to me. Thank you so much. It's amazing how we can pull together as women and give each other strength when we open our hearts. The bravest person I know is a good friend of mine who cared for her husband (and infant daughter) while he battled brain cancer... and then became a widow at the age of 29. She now is a fantastic mother to her two little children and always does everything with such hope and faith. I liked home sweet home the best. The bravest person i know is my mom, who rise herself up out of an awful home situation as a child, tackled raising 6 kids (4 of them boisterous boys) going back to school to finish a degree and get a grad degree, all while fighting cancer and parkinson's disease, and actively serving others in the church. One time I was stuck in an elevator with my young children. I was so ready to panic but I knew I needed to be brave so my children wouldn't be scared. So, I reminded myself my husband was outside the elevator (he had fortunately taken the stairs) and would help us get out. We prayed and sang Primary songs and I didn't panic!! We were finally saved. 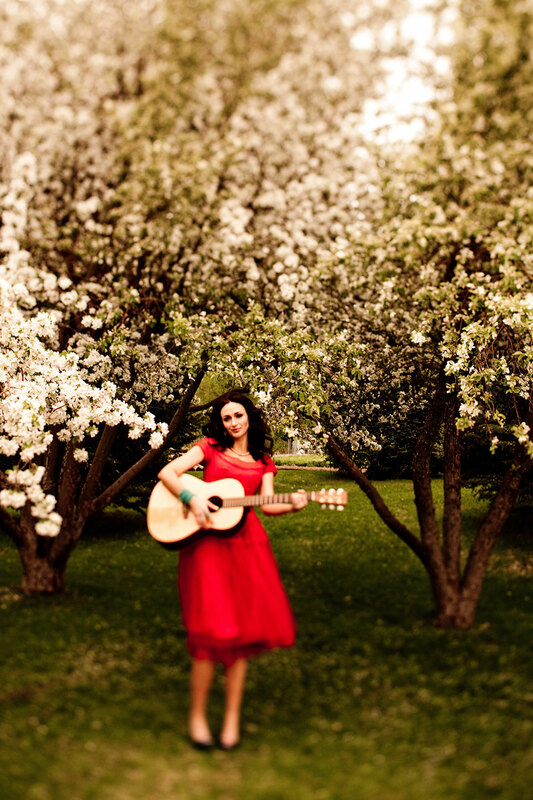 I previewed Katherine's songs and I really liked "Good for Me" and "Home Sweet Home". Thank you for sponsoring the give-a-way. I needed to brave durning my divorce. I went from being a stay at home mom for 8 years in an abusive relationship to... being homeless, jobless with no college degree, and with 4 kids ages 2-7 to take care of. Within a years time I had bought a house, and not only found a job but been promoted twice. Maybe I wasn't brave. Maybe I just had the Lord with me more than I ever deserved. The bravest person I know is my best friend who went into labor at 20 weeks, and then delivered a baby boy who couldn't be saved. She had the faith and the desire to try again and was able to have a baby girl after 5 months of bed rest. I see her bravery and hope to be like her. I time that I was brave was when I accepted the Lord's will that I wouldn't serve a mission, but that I would teach middle schooler's math. I loved the experience, but it took bravery every day to expect their respect and hope that the 35+ of them wouldn't tie me up and run wild. I had a few who pointed out that they could take on the whole school and it scared me for the rest of teaching. It was the biggest nightmare I had. I didn't know who sang that song Emma, and I am so glad to know. I love the song BRAVE. I want to share it with my sister, whos two daughters have Cystic Fibrosis. They are BRAVE. Both my sister and her daughters, because CF is uncurable. What a great giveaway! Well, one woman who is super brave in my book is my mom! She moved to RUSSIA as a missionary (my Dad is a mission president), leaving all her kids and grandkids and trying to learn the Russian language. She's a great example to me! I liked the "Good For Me" song and the "Virgin Lullaby." I had to be brave when my son was born prematurely at 25 weeks gestation. We had lost his twin brother two weeks before his birth. This experience and his time in the nicu were a sacred experience to me, I felt as though I was truly being carried by then Lord. But it took courage to face each challenge with and faith instead of negativity and fear. I like the song brave, so beautiful. I have to be brave every single day when I wake up and mother 5 children 10 and under. Keeping the faith, putting on a smile, teaching, learning, laughing, loving...bravery is very much a part of my every day life I feel. My mother is the bravest person I know. She has always been so selfless and giving, even though she herself has never and still doesn't have money to her name. She has shown that you don't need to have much monetarily, to give of yourself. She is a shining example of bravery as she loves all those around her. I love her more than she will ever know, she is my brave hero! I think I seriously love each of her songs...wow, I love her voice and style! But my favorite is the Emma song, I feel in love with that song from the second I heard it on the Joseph movie. It touches me, so powerful! I've had to be brave to bring my children into the world, especially after the first died due to complications at birth. My second had the same problem, but she was delivered before any damage could occur. I had such fear when it was time to bring my son into the world, but the Lord walked by my side and gave me courage. Now my bravery shows in raising my beautiful children. "Good For Me" speaks to me today, right at this moment, but I'm touched by the rest I've heard. Thank you for sharing. i just downloaded it and can't wait to start listening. I loved the song Emma. Especially after my recent visit to Nauvoo, it just speaks to my heart! I was brave when I was 15 and found the church. My parents were not very supportive at first and to continue going to church on my own, get baptized, serve a mission and get married in the temple all took courage, without any family support. My friend Jenny is the bravest woman I know. She lost her son when he was 4 and pushes forward in living life raising her other kids. She carries much sadness, but continues to mother with faith instead of fear. What a great post!! 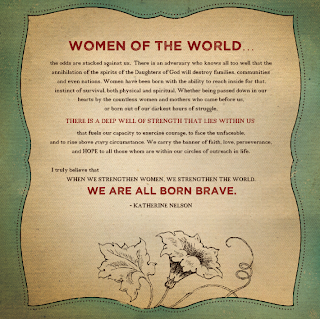 I am excited for the giveaway and I love reading the comments of the women and their stories of bravery. It is so very difficult to be brave in this day and age. I have three stories, but I'll share them in one comment. The first was being brave when my parents divorced. As the oldest of six and my mother leaving the home, my father wanted me to stay home for college and take care of the children. I knew if I did that, I would spiritually die. It wasn't a selfish choice, my home was abusive and I had watched my mother deteriorate under the pressure. I knew the same thing would happen to me if I stayed. Though I loved my siblings dearly and wanted to protect them, I knew I needed to strengthen myself and prepare for my future family. I ran away (not literally) to BYU. It was one of the most significant choices of my life. Two: Recently in CA (in the last few years) we passed Prop 8, defining marriage between a man and a woman. With the principal's permission, I approached our PTA board in their monthly meeting about supporting Prop 8 because in my opinion, the purpose of PTA is to protect children and their rights, which I believe Prop 8 did. They pretty much shot me down, but I stood for what I knew was right. Three: I think it takes devotion and courage everyday to have children, especially more than society deems acceptable. Having recently had our ninth, I am constantly amazed at the comments, even from other members. The question most asked is 'Are you done yet?' It is sad to me that we have to compare one to another and we cannot just rejoice with each other in whatever our circumstances happen to be, many, few, or none. It is plenty difficult for all of us. Thanks for the giveaway! And I loved the review! Oh dear, please excuse the typos in my previous comment. I'm swyping on my phone and did not proof-read. I like the home sweet home song. I was brave last Saturday when I played the piano in front of people for the first time (and with them singing to it, no less!). It was for a girl's baptism with ~30 people in the room and the bishopric member told me 5 minutes before they started that they didn't have anyone to play...so I played prelude and the closing song. Yikes! I felt brave that despite my imperfect hymn-playing, I dared to share what talent I *do* have (and not worry too much about my mess ups along the way) just so there could be some music to listen to. whew! I think the bravest I have had to be is when my daughter was in the NICU for two weeks because she stopped breathing a few times.